Physicians have been among the earliest of the early adopters of mobile technology, beginning with beepers and pagers, and then PDAs, smartphones, tablet PCs and other handhelds that make patient records and reference materials portable. With so many physicians already married to their electronic devices, apps for the iPad and Smartphone seem a ripe niche for pharmaceutical companies. "Healthcare is a mobile profession and lends itself to these devices," stated Bruce Carlson, publisher of Kalorama Information, a market research company. The global healthcare sector invested $8.2 billion in handheld devices and related applications in 2009, according to Kalorama. Social networks like Facebook, LinkedIn and Twitter, and hundreds of smaller niche sites allow physicians to organize professional online communities for collaboration. Physicians Interactive (PI), based in Marlborough, Mass., claims to have developed "the largest network of online and mobile healthcare professional relationships in the United States, reaching more than 875,000 physicians, nurses, and allied health professionals in all major specialties." PI serves its pharma clients through the development of mobile and online clinical resources for healthcare professionals. 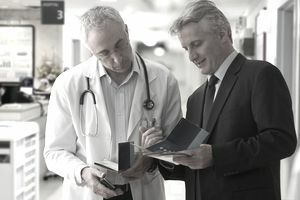 Marketing consultant Richard Meyer observes that the role of the traditional sales rep who constantly seeks face time with doctors is "fading." Meyer and other industry watchers say pharma need to re-tool their marketing efforts and bring more "medical communication specialists" on staff to engage with physicians online. These medical communicators could provide value-added services that help physicians sort through information clutter while facilitating links with clinical trials, journals, and knowledge opinion leaders.